After our first Give-Back session with the kids of Kumkang School, the thought about North Korea and the children of the defectors from North Korea has stuck in my Firstborn’s mind. While we were browsing for some books to buy at the YP Bookstore in IFC Mall, he suddenly blurted out, “Mommy, you should read this”. Oh, how quick his eyes were. It wasn’t stacked with the children’s books. He had no idea about the book. Neither did I. He just saw “North Korea” and instinctively assumed that it would interest me. Without any background information about the book and the author, I grabbed my copy with my son telling me I should read it to him also. Just a few pages of reading it out loud and I’m done. There’s no way I am going to expose him to such brutality and cruelty. 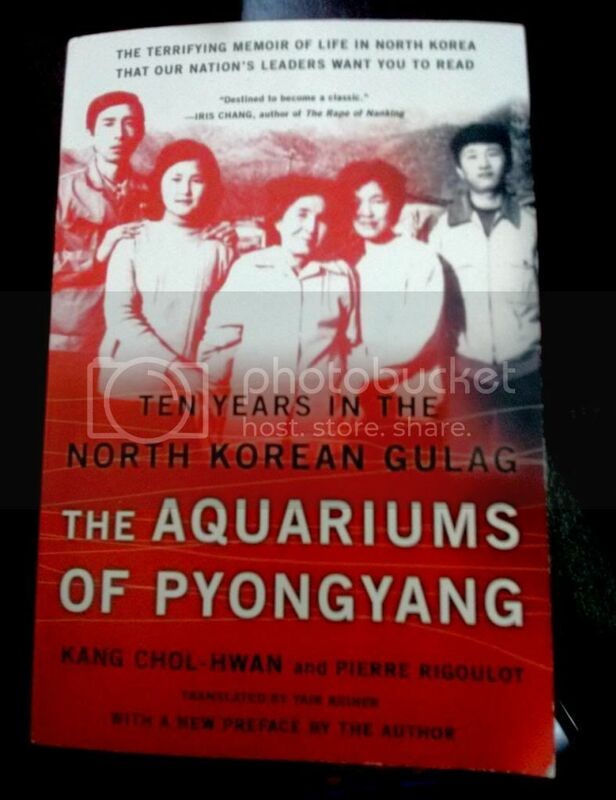 “The Aquariums of Pyongyang” is a very graphic memoir of a North Korean defector who had escaped North Korea. He spent 10 years of his precious life (from age 9 until he and his family were deemed worthy to re-enter North Korean life when he was 19 years old) at Camp 15, known as the Yodok Concentration Camp. It’s a life of cruelty, devoid of tenderness. In a lot of ways, Kang Chol-Hwan could be considered luckier than other defectors who survived North Korea’s concentration camps. He lived a privileged life during his childhood, a happy one, in fact. He didn’t fail to point this out many times in the book. He was taken as a prisoner together with his family (his mother was spared because one of her ancestors was considered a hero in North Korea) because of guilt by association. The “Great Leader”, Kim Il-Sung, had that brilliance to impose “yeon-jwa-je“, a tradition where members of a family up to the third generation shall be subject to punishment because of the perceived sin of a family member. And it is not just an ordinary punishment. It is a life spent in isolation, together with other political prisoners, stripped of human dignity. Kang Chol-Hwan was able to compare a relatively privileged life with his life in the concentration camp. His escape to China was relatively easier because he had the means to bribe North Korean guards along the way. He had the money to pay some people he met in China. But this relatively easy escape could not make up for the atrocities he experienced and witnessed while growing up in the concentration camp. It was an awful existence and reading the book opened to me for the first time how cruel North Korea’s leadership is. I previously just saw this small State as a communist country divided in the 38th parallel from the more prosperous South Korea. I never imagined such a life as cruel, if not more, than that experienced by the Jews during Holocaust. In North Korea, prisoners are classified into “redeemables” and “irredeemables“. The “redeemables” will have the chance to get out of prison, just like what happened to Kang Chol-Hwan and his family, with the exception of his grandfather who was judged as an “irredeemable”. These “irredeemables” are lifers who will never have a chance to get out of the camps. “To the Party and the socialist state, they were perfect zeros, worthy at best of supplying labor until their dying days”(p79). And through them, the North Korea leadership can retain their military secrets. Some of the children in Kumkang School may have been spared of the hard life in North Korea because their mothers or their fathers had the luck to get out of that impenetrable, secretive State but they have to go through a different set of struggles. They have no roots to look back to for theirs are inside that wired country. They are forever separated from them, with a nil chance for unification. For some, they are offsprings of survival from China (and this is a different story, a different problem but still an offshoot of defection from North Korea). We could only hope that they grow up seeing the opportunities in front of them and eventually they will look back and do something for the hundreds of thousands of people back in that country. But why is the rest of the world helpless against this tyranny? In this day of sophisticated technology, people can still fall prey and helpless against complex international negotiations and old concepts like national territorial integrity. in the meantime, concentration camps in North Korea continue to exist… and expand! I need to find a book store here in Busan! This was such a great analysis and pushes me to read it. Your boy is a bright boy! North Korea is such a great topic of interest, as there is always something new that is disturbing and horrific to learn about. My heart tells me to take a tour and visit the country, but my mind tells me HELL NO, CHELSEA.. DON’T TAKE THE RISK. I couldn’t help but think about the recent young American that got detained and convicted for “severe crimes against the state”, where he attempted to steal a propoganda sign from his hotel. Supposedly, he has a lengthy sentence of intense labour. North Korea scares me on all levels. Great post! Oh no, please don’t go. Aside from your safety, going there would mean you are helping their tourism. Problem is, any gains in tourism would surely just benefit the family of the dictator. Never, never take the risk. This is definitely a book I’ll be downloading to my Kindle. This analysis is great and it’s really making me want to read the book. I am really interested in this issue. I highly recommend the book Nothing to Envy – it focuses on North Korean defectors and the changes their lives made when they make their way to South Korea. Thanks for sharing this! Thanks, Laura. And thanks for this another book rcommendation. I used to bring my son to this school/dormitory for the children of the NK defectors so that’s why he is aware of these sad things. Although what he knows are just general things like “bad leader”, “hard life”. They’ll know about these when they’re ready… and on their own. Sad, noh? Very interesting book, even though it’ll be brutally sad. It’s amazing to know that these types of things are still happening around the world in so many corners. I look forward to reading this, and kudos for your son seeing it randomly! If you’re interested, “Without You, There Is No Us” is another great book written by a former North Korean university professor at an “elite” DPRK college for the upper class citizens. Fascinating country to our north, but it’s certainly a sad place to look into. I’ve heard about this book. It will be interesting to check this one from another perspective. Thanks. I went to a lecture given by a North Korean defector about two years ago. Even though we use the word defector to describe those escaping North Korea, refugee would be a more accurate term for people escaping such conditions. It’s incredibly difficult for them to escape and then to adjust to a world so different than they’re used to. Looks like an interesting read, thanks for sharing. I went to one also almost 2 years ago here in Seoul. The guest speaker is the author of this book. Which lecture did you go to? This looks like an incredible book and I would love to read it. Have you read, “In Order to Live”? It’s about a North Korean defector who was human trafficked in China. The amount of courage North Koreans have is incredible. I hope in our lifetimes, the Koreas unify and banish these concentration camps once and for all. Yeah, they are incredible! Another book I will surely check out. Thanks, Gina. As heartbreaking as these books are, I enjoy reading them. I will have to check this one out. Another book you may like to read is called Dear Leader. Scott and I both couldn’t put the book down. It’s about the journey of a North Korean defector who was a senior propaganda writer working under Kim Jong-il. It’s really an incredible, heart wrenching story. Thanks for the recommendation, Megan. Will definitely check that out. It’s heartbreaking and it’s hard to imagine living their life.